Fiber One review + 50$ gift card to Safeway! 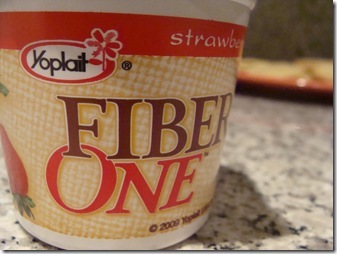 I was contacted by MyBlogSpark to participate in a review of Fiber One’s Yogurt. As a huge yogurt fan, I accepted. Not only did I receive a coupon for a free 4-pack of Fiber One’s yogurt, I was also given a 50$ coupon to spend freely at any Safeway store – how awesome is that! They come in 4oz containers of either peach, vanilla and strawberry. Perfect size for an on the go snack. They are only 50 calories, 0 fat and 5 grams of fiber, too. I sampled the strawberry flavor. 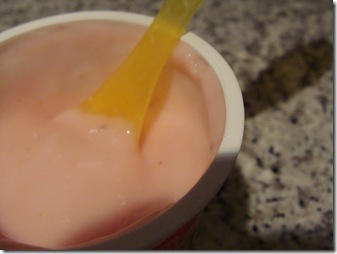 It had a smooth consistency… sadly this was the only thing I liked about this yogurt. It was very sweet for my liking and after one bite I could instantly tell there was artificial sweetener in it – yuck.! I am so used to wonderful Greek yogurt that I cannot stand anything else. Sorry Fiber One – you did not gain a fan with me nor did you win my Clean Eating seal of approval. I would much rather get my source of fiber from fruit, vegetables and beans. A medium apple with skin contains 4.5 grams, one entire medium avocado contains 13 grams and one cup of cooked parsnips has 5.5 grams… plus these taste much better! Safeway has been so generous that they are giving away ONE FREE 50$ Gift Card to their store! Not sure if there is a Safeway around you? Click here to view their locations! I will be drawing a name Monday, the 8th, in the morning. All you need to do is leave a comment stating how you get your daily fiber. Easy! 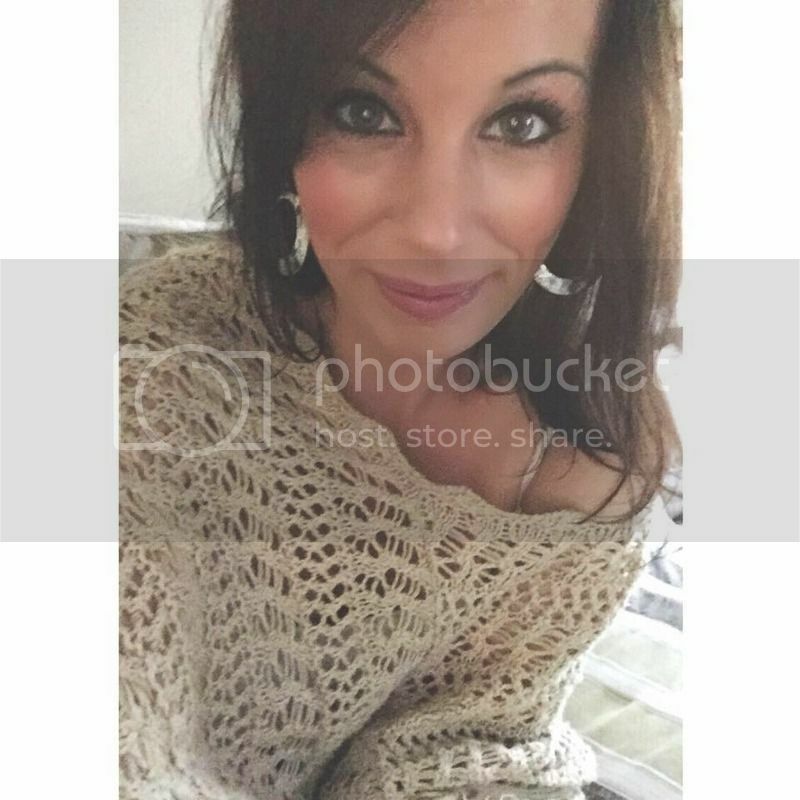 This entry was posted in give away, product review. Bookmark the permalink. 23 Responses to Fiber One review + 50$ gift card to Safeway! Hi Tasha, I love eating flaxseed in my pancakes, an apple a day, and while their yogurt did not win you over, they have delicious Fiber One chocolate chip bars at Costco that taste just like candy, give you plenty of fiber, and are only 140 calories!! Check them out:)Thanks for the wonderful blog- I love Safeway!! Ooh! Whole grains, leaving the peels on my fruits & veggies and lots of greens! Great post. I didn't really know about Greek yogurt until I started reading your blog and now I am hooked! So…thanks! ;)I have really been focusing on upping my fiber so this question is perfect for me! For me recently it has been oatmeal, apples, black beans and whole wheat bread. It really is amazing how much better it makes you feel!Have a good night! Fiber one yogurt makes me shudder, I kid you not. Glad to know I am not alone…..Veggies, fruits, whole grains, beans……. I agree with aspartame! I can't stand the stuff!!! Fresh fruit, veggi's and whole grains!! YUM!!! 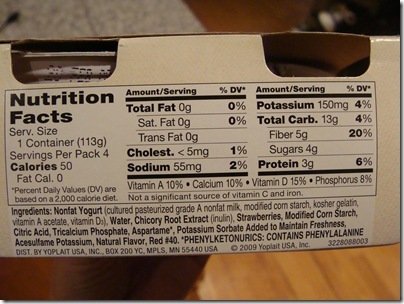 Aspartame = EW! I get my fiber with fresh fruit and veggies on the daily! Thanks for the honestly..I thought about trying them but now I am rethinking it.I get my fiber through whole grains and veggies. Oh i'd love to win! I get my fiber from my morning oatmeal and fruit thru the day! Love me some fiber….Liz B. Very cool on the Safeway coupon! I tried FiberOne cereal a few years back to up my fiber intake and now feel sick when I read the ingredients on the box and wonder what I was thinking 😛 Modified corn starch in the yogurt?!? Yuck! Totally agree, a fruit/veggie loaded smoothie is the way to go! I get my fiber from fruits, veggies, and whole grains. I love your blog!! I mainly get my fiber through fruits, veggies and whole grains.I've tried Fiber One before and found it to be okay. I'm such a greek yogurt convert now that once you go greek, you never go back!Thanks for the great giveaway! Thanks for the honest review…and I love my greek yogurt too!I get my daily fiber from fruits, veggies, & my fav trader joe's high fiber breakfast cereals!Thanks for the great giveaway…and for writing such a fun blog! J is ADORABLE! I get my fiber from beans, oatmeal, apples, flaxseed…. Hi Tasha! !Beans, Beans they're good for your heart…and you know the rest 😉 I also love oats, apples, broccoli, strawberries, and the occasional Kashi bar! mmm… i eat oatmeal, flax seed, and sometimes benefiber. Oh Fiber One has good yogurt, ate it all the time before I discovered Greek. It's still the best regular yogurt out there. daily fibre – breakfast smoothies, whole grains… all that good stuff! 🙂 PICK ME!!!!!!!! !